Since 1992, we’ve been dedicated to putting healthcare within reach of the many people in our community who need it. While our vision for a healthier community remains the same, our reach to the communities that need our services has grown tremendously. Today, we announce a new name that better reflects our commitment to the health of our community, and a new logo that symbolizes our promise of delivering access to quality, affordable, healthcare. We invite you to be part of this journey as we turn the page in our story and embark on a new chapter for community-centered care. While our name may change, our dedication to your care never will. Play a short video about our transformation from Escambia Community Clinics to Community Health Northwest Florida. What does this name change mean for me? 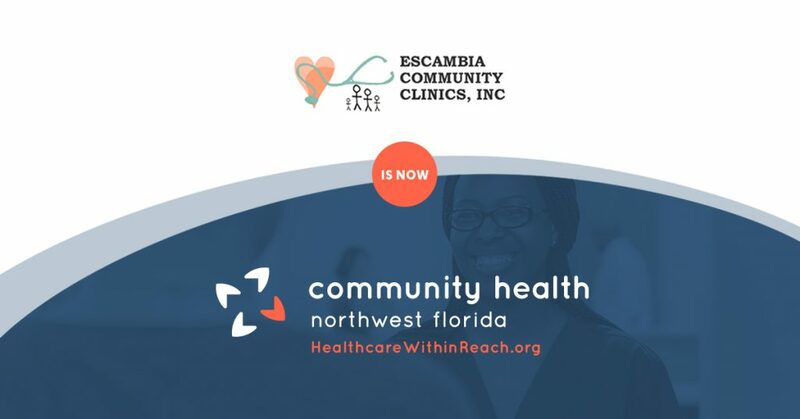 On February 23, Escambia Community Clinics will transition to its new name, Community Health Northwest Florida, and a new logo. The changes will be effective Friday, February 23. There may be a transitional period of several months as we update our systems, signage and processes to reflect the new name and logo. You may still receive correspondences from Escambia Community Clinics as we phase out our old name. Only our name and logo will be affected in the change. You will still receive care from the same providers at the same locations that you typically visit. Are you being bought out? No, our decision to change our name and logo is fueled by our desire to better align our name with our mission. We will still remain a non-profit community health center governed by a board of directors comprised of community members whose mission is to provide access to quality, affordable healthcare. Will I still have my doctor or nurse? Yes, your doctor or nurse will remain the same. Will I have to go to a different location for care? No, services and locations will not change and you can continue going to your care site as you typically would. Will the cost of services go up? No. We are committed to delivering access to quality, affordable healthcare. Our decision to change our name or logo will in no way affect the quality or cost of care you receive.